Photo courtesy of Booth regular, Jess Nichols of Sweet Eventide. I opened the door to my kitchen cabinet - that kitchen cabinet. The one where I keep all kinds of crazy stuff that has rarely been used but "might" be used some day. This is where I've got my iron tortilla press. Yup. That will work. That crazy manual food chopper that I bought at a Pampered Chef party. That's totally in. The salad spinner, of course. What else. I reach back to make sure I'm not missing any other fun kitchen gadget, any thing else that might entertain a host of first and second graders. Aha, the egg slicer I picked up at a garage sale. Score. Together with my good friend and fellow Boother, Jess Nichols, I will be running a cooking center in my son's class this year. I'm both excited and terrified. Excited because, due to some major allergies, the curriculum will need to be entirely redone and there will be no room for canned Pillsbury biscuits in this one. And terrified because I've taught a cooking center before. Its a frenetic twenty five minutes of keeping kids safe, entertained, all the while prepping for the next group. Not for the weak of heart but this year, I'm determined to channel Jaime Oliver and bring real food into the classroom. First, its about creating the cooks of the future. I came across a great website, Kids Cooking Lessons, that lists cooking skills appropriate for different age groups. Kids in my center should be able to read recipes, read labels, learn what cooking tools do, learn to use a microwave and continue learning about staying safe in the kitchen. The website even lists age appropriate tasks which include cracking eggs (do it at the bottom of the bowl to minimize mess and maximize egg actually making it into the recipe), filling and leveling measuring cups and spoons, using a vegetable peeler, using a can opener, kneading and rolling out dough, filling muffin tins and so on. Culinate's article, A Child's Place Is In the Kitchen, has a number of great tips as well. Next task is to create eaters of the future. My hope in taking this on is to get a group of kids to move beyond hamburgers and mac n cheese. Last week, we tried Cold Cucumber Soup. Nearly every child tried it and some of them even liked it! - Spring rolls with loads of in season veggies. 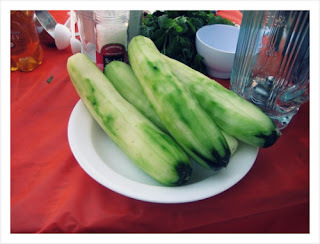 Kids prepare the veggies, smelling and tasting them as they go and then fill their spring roll with whatever they want. This one I did in kindergarten and it was a huge hit. - Homemade tortillas using my fun tortilla press. - Omelets with different veggie fixings. Many kids I know don't eat enough protein and fresh eggs from backyard chickens - mine or some belonging to other families in the class - might expand their palate. - Butter. The Crunchy Chicken way. - Deviled eggs or egg salad. - Pizza with sliced tomatoes, fresh cheese and herbs - not the sauce and shredded cheese kind. This way the kids can really connect with what they are eating. - Falafel and taziki. Its fun for kids to form the balls of dough plus this has chickpeas in it for a good helping of vegetarian protein. Bake instead of fry. - Salad. Complete with salad spinner - yes the kids do LOVE to spin that one - and home grown sprouts. I'll bring in a jar for them to start the sprouts and another where sprouts are already done and ready to eat. - Pancakes with seasonal fruit topping. - Anything from the divine kid-friendly vegetarian cookbooks, Salad People and Pretend Soup. Those even come with pictorial recipes - perfect for the early reader set! - A session where kids plant a seed in the school garden and then another, much later in the year, where they come back and harvest it. - Another session that teaches kids about sprouting. 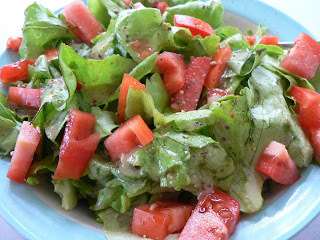 I'd bring in the final product for some salads or sandwiches. As I pull out the box grater from the top shelf and add it to the pile of cooking gadgets, I smile. I envision myself trolling thrift stores for more tools. I imagine peering into farmers' market stalls for the latest, most in season veggies for my cooking center students. And I think of the looks on the the children's faces when a bold boy tastes an onion RAW! or the way a gaggle of girls gathers together to smell mint leaves. Yes, the cooking center will be a wild ride but I'm pretty sure we'll end up in a tasty place. Since the day my husband and I were married nearly nine years ago, I have cooked probably 90% of our dinners. If you had asked me four years ago, if we ate healthy, I would have said yes. If you had asked me four years ago if I was a good cook, I would have replied, "Not too shabby." We never ate frozen dinners (except for pizza). I only gave my kids 100% juice. Junky snacks like fruit snacks and fruit roll-ups were reserved for special occasions...And yet, pretty much all of our food came from a box, a bag, or a can. Three and a half years ago, I decided to join a CSA. 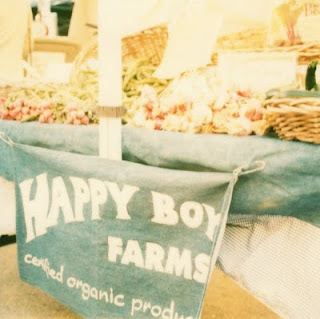 The day I received my first bag of goodies, I stood in my kitchen surrounded by beautiful local/organic produce and thought to myself, "Now what?" The only broccoli I had ever cooked came in a bag: I would dump them into a bowl, add a tablespoon of water and some salt, and nuke 'em until they were warm. Easy peasy. Now here I was with a raw head of broccoli and no idea how to cook the thing. Boil it? Steam it? Fry it? Can we eat the stalk? The leaves? In the past three and a half years, I have learned to cook vegetables from Asparagus to Zucchini. Thanks to our CSAs, we have tried veggies I wouldn't in a million years have picked out myself...and discovered that we like them. We eat much healthier because most of our produce is fresh and in season, most of our food is free of preservatives and artificial flavors, and nothing that we eat is a weirdly neon orange color. And I have learned to cook well enough that I'm losing my appetite for eating out. 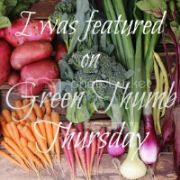 This month, I'm challenging you to Green Your Groceries, and learning to cook is an important part of that. When you know how to cook from scratch, you can buy basic ingredients like oats, beans, and rice from the bulk bins and cut back on your trash production; use fresh, local, and seasonal ingredients, casting a vote for a reformed food system and keeping your family healthier; and save money, making it possible for you to afford those fresh, local, and seasonal ingredients. Learn to make a roux. A huge portion of recipes start with a roux, and once you can make your own, you'll be free from canned sauces and gravies. Make a list of your family's favorite meals and learn to make them from scratch. Or obtain a good basic cookbook and find some new favorites. Join a CSA. You'll be forced to learn how to cook or let your vegetables/money go to waste. Purchase a good knife and keep it sharp. You know those big wooden blocks that come with a dozen different types of knives? You probably have one sitting on your counter - I used to have one too. But here's the thing about cooking: you really only need one good knife - maybe two - as long as you keep them sharp. Sharpness is key; my knives are on the very blunt side right now, and it's really slowing down my cooking time. Do you cook from scratch? What tips do you have for beginners? 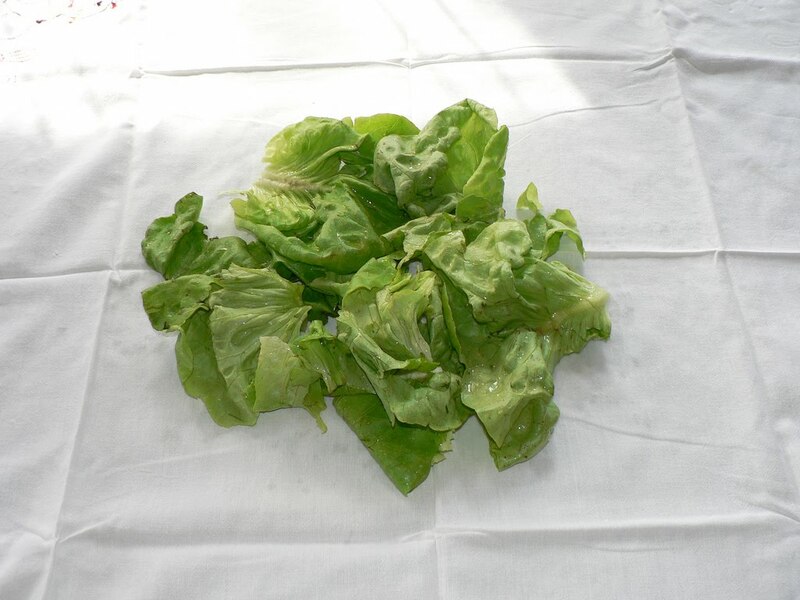 Since my greens come fresh from the farm, they are often not clean. No pre-washed plastic-bagged veggies in this house! Also no plastic salad spinner. 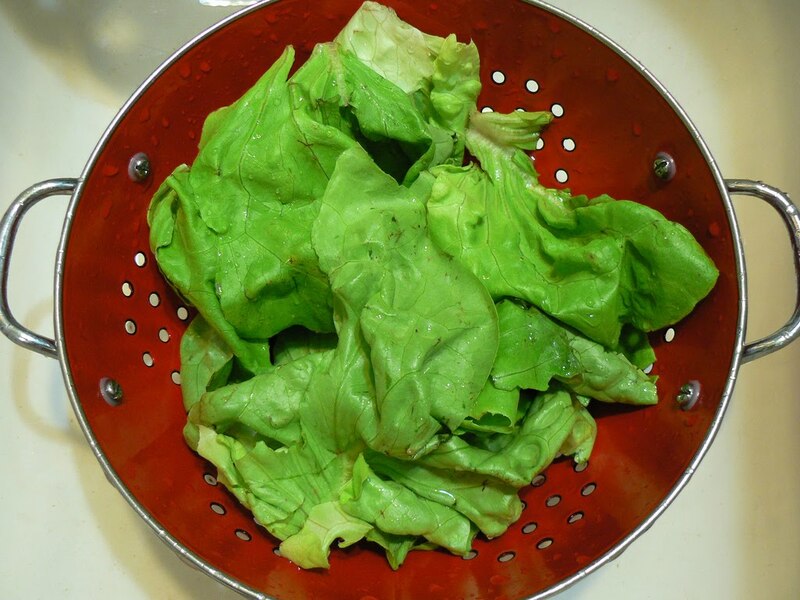 Yes, I do wash my lettuce, I assure you. I am sure a little dirt will not kill me, but that does not mean I wish to eat it. 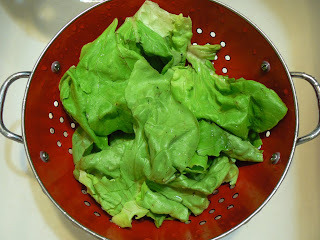 I just use a low-tech, low-impact method of drying my greens. Place greens on a clean, thin towel. 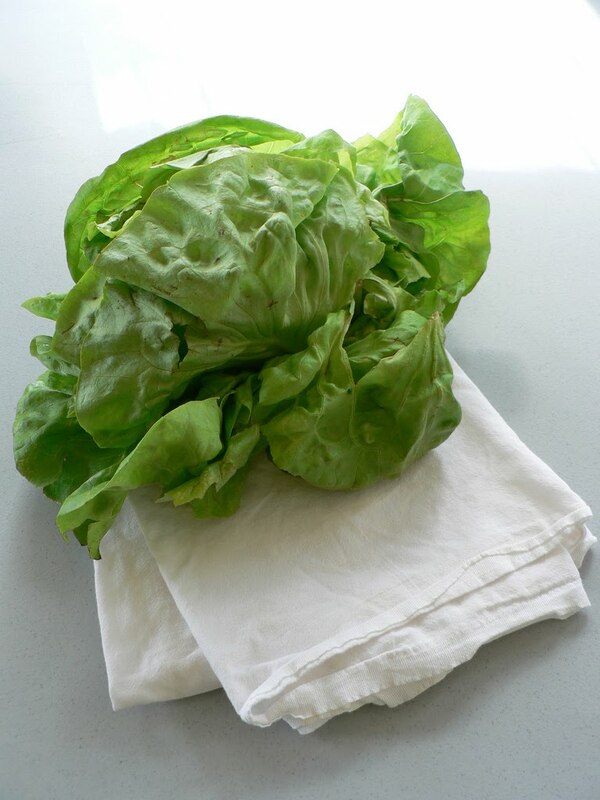 Fold towel over on greens. Gather towel corners to create a neat little package. It is best to do this outside as you will have water flying everywhere. I don't know what I was thinking once when I did this inside. I had a streak of water up the wall, across the ceiling, down the wall behind me, and all along the floor! It eventually dried, but still, do this outside. Just keep spinning until no more water flies out. I stop once or twice to open up the towel and shift the greens around. That way no water gets trapped between leaves. It is simple, effective, cheap, takes up way less shelf-space in your kitchen, and keeps one more piece of plastic out of your life. Glancing around the crowded room, I realized I was surrounded. Pirates over here. Princesses over there. Batman, Spiderman, Wolverine. Cinderella, Tinkerbell, and the Little Mermaid. Witches and wizards galore. Yes, Halloween has arrived at my local Goodwill. Is the holiday season really almost here? It seems like just yesterday I was penning a tribute to pumpkin season, but no. 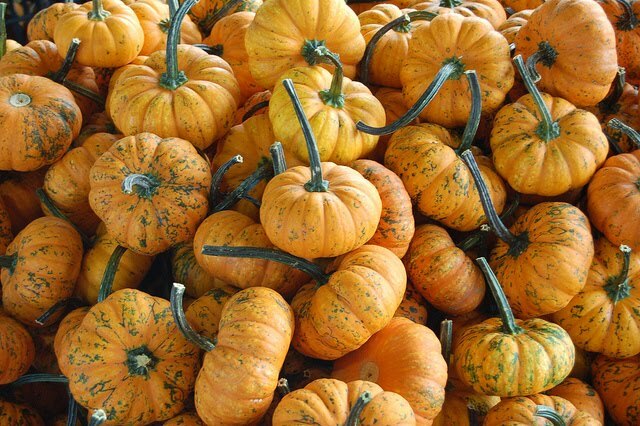 It was nearly a year ago, and pumpkins have once again started trickling into the stands at the farmers market. The holidays can be one of the most hectic, wasteful, planet-destroying times of the year. Or with a little change of behavior and attitude, they can be a great time to show off your green side with thrift store decorations, re-purposed costumes, and handmade gifts. Here at the Green Phone Booth, we want to help make your holidays more meaningful, so we're inviting all of you to participate in our Meaningful Memories challenge, starting now (in time for Halloween) and continuing through the end of the year. 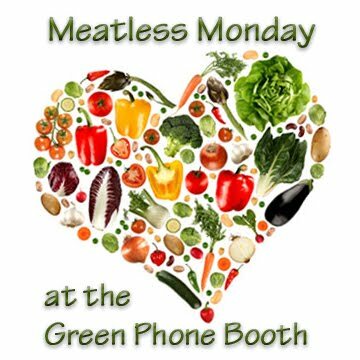 Every Monday, we'll be blogging about ways to green up our holiday celebrations, but we know you greenies don't need to be shown how it's done...So we're inviting all of our lovely readers to share your inspiration with the rest of us by submitting a guest post to be published here at the Green Phone Booth. You could also write about green Halloween ideas (decor, costumes, parties...), focusing on the "thanks" in Thanksgiving, or making green resolutions for the New Year. If you'd like to write a guest post for the Green Phone Booth, email me at greenphonebooth [at] gmail [dot] com with your topic idea, and I'll put you on the calendar. Are you ready to make your holiday memories more meaningful? Halloween is little more than a month away, yet I've already gotten a headache. No, it's not from the rows upon rows of giant-size bags of chocolates. Nor from the cheap costumes for sale, which I largely avoid. No, it's from the little green-eyed monster, who is basking in the glow of consumerism. Just one trip to Target the other day proved it. En route to grabbing bread and a few items for dinner, I was barraged with requests for Halloween headbands and chocolate and costumes. Nevermind that I've found ones for both kids at the resale shop, apparently I now need one too. Yes, the green-eyed monster is in full swing. Sadly, I don't know how to upend the cultural crap that is Halloween. 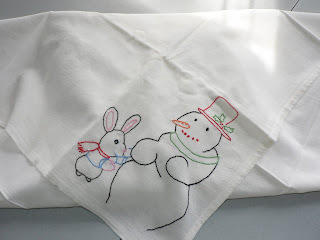 Granted, when I was a child, we tricked and treated our way around the block, lugging handmade sacks or pillowcases. Today, it's a serious industry. Hundred-dollar Disney dresses plus accessories. Plastic containers with every character known to man on them (which of course will be pase' next year.) And decorations gallore. Hit the closets. Some of the most imaginative costumes come from, well, your imagination. My favorite was a few years back, when my first communion dress came to life as part of a Mary Poppins ensemble. My second? When I was seven months pregnant with my son, and I cut out a while "M" to put on my belly. Find a swap. Check out the National Costume Swap Day Web site for an organized swap, and trade in your outgrown costumes for something new to you. Or check out a moms group, trading site or resale shop for other options. Make your own treat bags. Each Halloween, my brother and I would break out the crayons and decorate a paper grocery bag for trick or treating. Last year, I started the same with my kids, opting instead to buy two orange paper gift bags from the craft store. They were just right for little hands, and didn't get weighed down too much. And they're waiting to be broken out in a few weeks. Take the emphasis off of candy. Get those Happy Meal toys out. Seriously. Instead of loading kids up with more candy (have you not seen childhood obesity rates lately? ), I've been silently corraling extra toys that somehow make it in my home after parties or excursions with the grandparents. While the kids are trick or treating, a bowl of new to them toys and trinkets will sit outside for our visitors we miss. Or, instead of toys, consider giving out gently used books. It's an interesting idea. Help others in the process. Consider doing a trick or treat for UNICEF or other organizations helping others in need. And after the event, reuse your stash by hanging on to those chocolates for holiday baking. If you can resist. Any other great ideas for lessening the Halloween headache? Hello Green Phone Booth readers, this is Jess from Sweet Eventide reporting for duty. I know I promised you photos from my field trip last month. Unfortunately while my field trip worked schedule-wise for both parties, it did not work light-wise and being a photographer, it's all about the light and even processing cannot make the photos I took sing to my heart's content. So I have to reschedule that post and report back at a later date about my field trip and the photos need to do that organization and its amazing school garden proper justice! So today, I'll stay close to home. As in home decor, interior design, and how to combine all that with a desire to support companies who are not trashing our beautiful earth. This is how I shop for house stuff in general, and keep in mind that general = rarely. I go to a website or store and I find things that are visually appealing. Then I do the math and see if it's out of my price range (because I have already tried hard to be at a company that I'm willing to do business with which means not a big box, and/or shipped halfway across the world). Then I get creative and find a way to achieve a similar look at a lower cost/price (cost to the earth/price to my checking account). I have not actually purchased a FLOR modular area rug *yet* but I've had my eye on them for years because their patterns are attractive and they are really trying to make a good product that is practical for busy, active families (with pets) and not at budget-breaking prices. 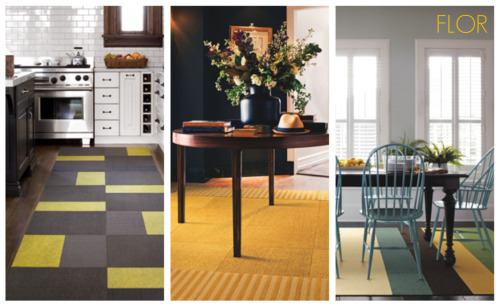 Here are a few designs that caught my eye recently when a dear friend was rug shopping. 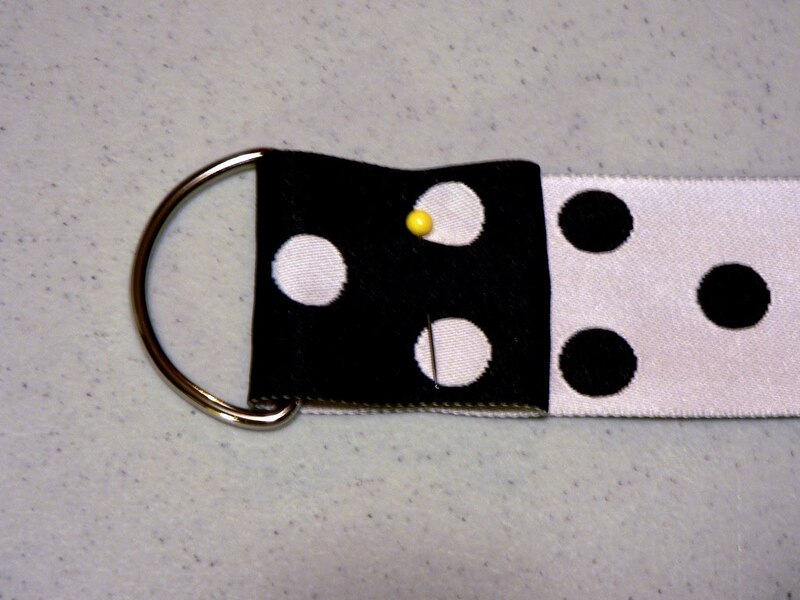 They seem simple to assemble with stick-together, non-toxic "dots." They range from $5 to $30+, most seem to be around $15. One of the cool things about FLOR is you could buy the tiles a few at a time as your budget allows and then assemble when you've got all the tiles. I squinted and bent over, rummaging through the pile of canvas bags and children's artwork, frantically looking for my prescription sunglasses. I found something smooth and hard - my glasses case! But it only held a regular pair of sunglasses - for those days when I wear my contacts which is pretty much every day that I don't have a splitting headache. I tossed the case back in the glove compartment and turned the key in the ignition. Sunlight streamed through the windshield, tightening the vise around my head. 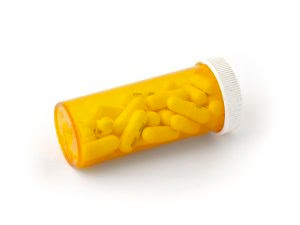 I ignored the throbbing and barreled down the street toward our 24 hour chain pharmacy - a written prescription for migraine medication burning a hole in my purse. Sure, I could have traveled one town over, to an independent pharmacy. Two brothers own it. They know my name and my prescriptions when I walk in the door. They vote the way I vote. And, they are closed on Sundays, before 9:30 in the morning and after 5 o'clock in the afternoon. It often takes them at least a day to get the medication I need. That means that if I hand them a prescription on a Saturday morning (or even a Friday afternoon), I won't get it filled until Monday mid-day. I've tried to work around this by planning ahead. By counting leftover pills in a bottle or puffs in an asthma inhaler but sometimes, life happens. I've spent one too many weekends with a blinding migraine and no medication. One too many nervous nights with a preschooler whose inhaler was running on empty. And so, today, I pull into the drive-through at Walgreens. A nameless pharmacy assistant who has no idea who I am takes my prescription. I get a text message 15 minutes later than my medication is in - though I am advised to check and make sure it looks the same as last time when I pick it up. Big pharmacies are notorious for accidentally giving out the wrong medication. I check. It is the right medication. A half an hour later, I'm good. Or at least the headache is gone. But what about my commitment to support independent businesses? I walk into a nearby, locally owned children's bookstore and it hits me. I love this store. Their selection is wonderful. Their staff fantastic. They can recommend "read-alikes", new books, new authors. The store offers classes, parties, author readings. If they don't have what you want, you can order it in the store - or better yet, off of their website, which in and of itself is a font of incredible information. It is important to shop local but, the truth is, local businesses need to adapt to survive. Natural selection and all that. This local bookstore is not the first on our street. Another went out of business after only a year. It couldn't offer the same selection. It didn't have a website. It couldn't compete. To make this "buy local" thing work, we all need to change. We, the consumers, should go out of our way to support locally owned businesses. Independent businesses increase diversity in the marketplace, bring more money back into local municipalities, create meeting places, build community, discourage urban sprawl, and so much more. They, the independent businesses, though, need to constantly think about how to satisfy a consumer used to convenience, one raised on 24 hour service and Internet shopping. Those businesses that do adapt will be the first to get my dollar. I bring my book purchases up the counter. The owner adds them up and then puts the tally with my frequent buyer program. Woohoo! I hit the milestone and get a $10 gift card back. Apply it to my total, have one of the books wrapped for a friend's birthday, and am on my way - feeling less guilty about the Walgreens prescription bottle in my purse and looking for more ways to support the local guys, without giving myself a headache. Keep a price book, a book where you record the lowest price that you can find a product in your area. Take your price book with you when you go shopping so you can tell whether or not a sale price is really a deal. Menu plan. Plan ahead so you're not throwing items into your shopping cart that you don't need and/or won't use. Stock up when items are on sale. Use coupons. I haven't had much success with using coupons on organic foods - the store brand is almost always cheaper, and it's harder to match coupons with sales since fewer items go on sale. I personally think this will change as organics get more popular, but in the meantime, you can use coupons on other things like cleaning supplies, personal care products, and even places outside the grocery store (like oil changes and restaurants) and shift your savings to your grocery budget. Buy store brands. They're cheaper, and they almost always taste just as good. Start with the Dirty Dozen, the fruits and vegetables with the highest pesticide residue according to the Environmental Working Group. Waste not, want not. Avoid letting food go to waste before you use it, and eat up leftovers. Find amazing deals with bulk bins, the bins of grains, nuts, and dried fruit at Whole Foods and other natural food stores. I wish I could buy everything from a bulk bin! Buy in bulk. If you can't find it in a bulk bin, buy the largest size you can find. But remember to keep your eye on the unit price! Sometimes, the bigger package has an inflated price. Choose less expensive fruits and vegetables. Around here, greens and sweet potatoes have the biggest nutritional bang for your buck. Eat less meat (especially cow). A serving of organic beans from a can is about $0.30. An organic egg costs about a quarter. A serving of the cheapest organic ground beef I've seen is $0.75. Buy a share of a cow. If you're not keen on going completely vegetarian, you can save money on your meat products by buying a share of a cow directly from a farmer. Search for local farms at www.eatwild.com. I've also heard of cow-shares for dairy products. Join a CSA (Community Supported Agriculture). Pay a fee at the beginning of the year and get a share of the farm's produce. Some CSAs are very good bargains. Join a buying club, a group of people who place huge orders directly with food distributers, saving costs by buying in bulk and cutting out the middlemen. The biggest supplier of natural and organic foods to buying clubs is United National Foods. I don't have any experience with them, but I have successfully found some savings on organic grains and legumes through a buying club with members of my church. They order from Walton Feed. Pick your own fruits and vegetables. If you do the harvesting work yourself, you can typically save a lot of money. Find an organic pick-your-own-farm near you by visiting www.pickyourown.org. Do you have any more tips for smart shopping? Have you ever seen that show Wife Swap? I have not actually watched it, but I know the premise. Two wives swap families and must at first live by the other wife's rules, then the new wife can implement some of her own. Ever wonder what might happen if someone new was transported to your home and expected to live the way you do? What would they think? How would they react? What would they change? I think if someone from the past suddenly showed up at my house they might do alright. No television, microwave, computer - obviously we have these things, they just do not work without plugging in or turning on the power strip first, practically the same as not having one, right? All the cookware is glass or cast iron. We have cookware! Our food is actual food - that has to be prepared - not some food-substance that comes prepared from a box or poured from a jar. Unless they have found my stash of salsa and tomato sauce that I canned this summer. There is food growing all over outside. Tomatoes, carrots and squash in the front yard. Celery, basil and peppers along side the house. Chives and broccoli by the shed. Beans and cucumbers by the garage. Berries out back. Plenty to eat. Behind the house is a clothes line as well as one in the basement. Hell, even the clothes hanging on the line are vintage! But what would happen if some poor unsuspecting normal person from today was suddenly thrust into to my alternate universe and expected to live the way I do? What would they do? I suspect the first they would do is go shopping. There is not a single thing to eat in this house! Have you seen the cupboards? Nothing but a bunch of noodles and some unidentifiable stuff in jars. What is that? And how old is it? And why the hell is nothing labeled? This kind of looks like sugar, but it's a funny color and I don't want to taste it to find out. Where are all the boxes and bags that tell you what stuff is? What do you mean I have to make it? What the hell am I supposed to do with a squash? I don't even know what that is. Yeah, I know there are pots and pans, everybody has pots and pans, but that doesn't mean they actually use them! What's wrong with this damn microwave? I can't get it to work. The TV and computer are the same way. The silence is killing me! What do you mean she doesn't have an iPod? Who doesn't have an iPod? Radio? You want me to listen to the radio? Do I have to plug it in first? At least I could call somebody for help - if I could figure out how to use this stupid phone, what's with the cord? Get a cell phone already! Only the entire world has one. Cripes, even my 10 year old has a cell phone. I'll try it, but I'm telling you there is no way in tarnation that molasses is coming out of this towel. Okay, okay, into the washer you go. Hot, soap - mmm... lavender, bleach... where's the bleach? Now this is just silly. I already had my doubts, but if you think that towel is going to come clean washed in cold water with this BORAX stuff then you are the wacko. Whatever. Not sure why I should even bother wasting fabric softener, that towel is just going to end up as a rag anyway. No fabric softener? Well, of course not. She's crunchy just like her clothes. Hmm... what's this next to the dryer? Oh. My. Gawd. Are those... WORMS!?! Eww!!! Get it off! Get if off! Don't ever open that again. tee hee... You don't want to be in my head or my house. In the kitchen with the Conscious Shopper. 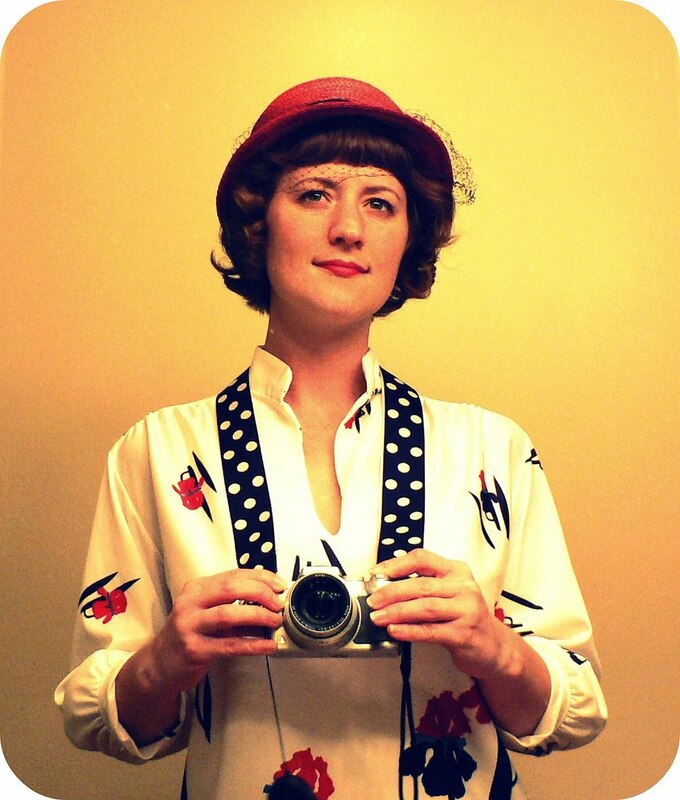 Remember when Jess was cleaning house and wrote about "aspirational clutter?" Yeah, I have that problem. Especially when it comes to cooking. I'm always clipping recipes that make me drool onto the magazine's pages and stuffing them into an already bulging folder so that I end up with more recipes than I'll be able to make in the foreseeable future. I'm sure my bookmarks will fill up quickly once again, but still, I thought I'd ask: What recipes are in your aspirational cooking folder? What recipes have you seen that you plan to make, but haven't gotten to yet? Remember to keep it meatless, as this is Meatless Monday! And don't forget to link up your own recipes using Mr. Linky below. I am slow to get things done. One of the Baby Step challenges way back toward the beginning of the Conscious Shopper Challenge was to get a reusable air filter, and I totally meant to...but I am slow to get things done. So two months after the challenge, I sent my husband out to get us a reusable air filter. For some reason, he went to Walmart (which was odd because we rarely ever go to Walmart), but the filter he brought home was the wrong size. Another month passed, and I found myself at Home Depot staring at air filters. They had one reusable style, also the wrong size. Finally, last month, I started searching around online, and I found a company called Air Commander, Permanent Air Filters that was having a 50% off sale. Perfect! 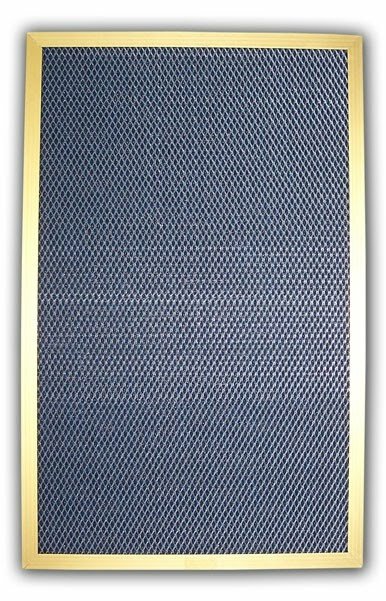 We decided to go with their Gold Enforcer 94 with a gold anodized metal frame because it seemed to be their best filter and I figured if you're going to buy something that lasts a long time, you ought to buy the best. We've been very happy with our purchase. The frame seems to be well constructed, and although I haven't cleaned it yet (we've only had it installed for a couple weeks), it doesn't seem too difficult to clean. We had a slight confusion about what size we needed to order which was totally my fault, but their customer service was excellent and cleared the problem right up. So if any of you readers are also slow to get things done and still need to check off that Baby Step of the Conscious Shopper Challenge, check out Air Commander for reusable air filters. Disclosure: I purchased this product with my own money and was not asked to write any sort of review at all, but I was pleased with their very helpful customer service, and one good turn deserves another. I just returned from a conference for work. Every communication we got, we heard about how the conference is green this year. The presentations were available for download before the conference - no paper copies were available. 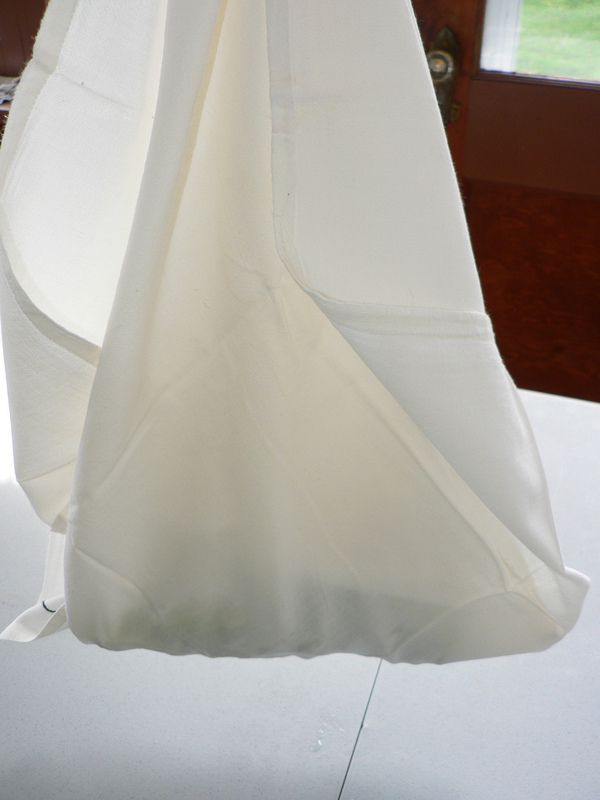 The bags were grocery bags from organic materials instead of the usual totes. There were no water bottles to be found. They touted getting a travel mug when you were arrived, but none were to be found. The badge lanyards were made of reclaimed and recycled materials. But I'm wondering, while it was a good start, it felt more like a cost-reduction effort than a strong step towards being green. The NYU Hospitality Industry's reception food at designated green stations is grown locally, on New York and New Jersey farms. And their conference program book and quick reference guide were printed with soy ink on 30% recycled paper. The NMBMA is donating excess materials to worthy causes. They're eliminating floral centerpieces and decreasing the number of shuttle trips between conference venues, making sure all hotels are within walking distance. The Utility Payment Conference is promoting using public transportation to get to its event and using online tools whenever possible. The NMC is contributing a portion of the conference revenues to offset direct emissions resulting from the venue space, hotel, meals and the travel of NMC staff, the NMC Board of Directors, and all the major speakers. What are your suggestions for making conferences or corporate travel greener? Okay, by now anyone who reads my posts with any regularity probably knows that I have an extreme interest in FOOD. Cooking it, eating it, developing recipes for it, finding ways to make it harmonize with a healthy lifestyle, where it comes from, who grew it, what went onto it or into it before it became food, and so forth. I've been struggling with some issues lately, not sure how I feel about some things. This has been brought on by a number of different Things happening in my universe. One is a good friend who is losing a lot of weight and trying to health-up her eating habits, by going on a 30 day "cleanse" program. It sounds a lot healthier and more common-sense than most of the cleanse programs I've seen, but it still involves buying a lot of a particular product and substituting shakes and powder-mixed-with-water kinds of things for actual Food. And she honestly seems healthy and strong and full of energy, and she's really happy with how she feels, not to mention getting into jeans that have been at the bottom of her drawer for a couple of years. Another is a post by a friend of mine over at Gotta Sing Gotta Pray--this is a blog related to my "real life" stuff of my day job, which is church music. Alan is a fabulous musician and poet, and the bulk of the post might or might not be interesting to you...but scroll all the way down to the bottom, and you will see his recipe for "Poetic Alfredo Sauce": one part butter, two parts cream, three parts cheese. Add salt and pepper. Simple, "real" food. And at the very least something that's not gonna get anyone into the jeans they haven't worn in a couple of years, unless one was maybe pregnant a couple of years ago. The convergence of these two things has gotten me thinking about food and weight and health...honestly, I've always tended to go with Michael Pollan's "Eat all the junk food you want, as long as you make it yourself" (Food Rules, #39) maxim--in which case, that Alfredo sauce absolutely qualifies. And in moderate quantities, over whole wheat pasta, once in a while, it wouldn't be a bad thing. Especially if you know where the butter and cream and cheese come from. Then again, my waistline and thighs attest to the reality that maybe this isn't quite the way to go, especially for someone like me who really enjoys and gets a huge kick out of making my own food, junk or otherwise. Someone who has a crazy-good sense of smell and who enjoys the beautiful layers of some simple (or not so simple) and home-cooked food the way I enjoy the layers and colors of a Mahler symphony. There's joy, and there's art, and there's the feeling of being a human being truly enjoying being human. I am not someone who equates "being thin" with "being healthy"...but on the other hand, I suspect that though most of what I eat is whole and real food, minimally and ethically produced, I could use a lifestyle change of sorts. And if being "green" goes along with "going with the the natural needs and desires of the earth and the body," any kind of drastic "stop eating food" plan just seems...unnatural. I'd be interested to know other people's thoughts on all this...I mean, obviously, I know the "everything in moderation" concept, but...where's the balance? How do y'all do it? It wasn't long ago, my tight little yard boasted an overflowing vegetable garden. Brassy French heirloom pumpkins lounged along the sidewalk. Grapes groped across the arbor, eagerly seeking to be plucked. 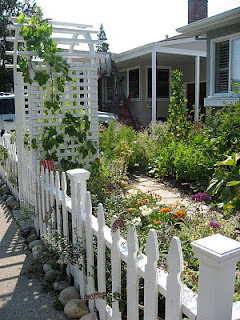 Cherry tomatoes flaunted their wares to any passerby not willing to avert their eyes and herbs peered through the slats in our white picket fence. Those days are gone though. We left that little house, where sun only graced the front yard and where fruit trees and a chicken coop were pinched in between backyard fences. Our new yard sprawls and wanders. Neglected fruit trees and a newly built, large chicken run dot the landscape. I fell in love with this yard when the house was last on the market - a mere two years ago. Nothing else since compared to the promise, the prospect that this yard presented. To this blank slate. When the house came back on the market, we pounced. And yet, there is something about blank slates. Figuring out where to start can be paralyzing. Oh yes, there are things like sun exposure to calculate in but pretty much everything else is open to negotiation. And so, I stand here on the steps of our back forty and wonder. What fruit trees should I plant? Besides a lemon and mandarin orange, which I want to put in a flower bed along the fence behind me (goodbye ivy! ), what should join the apple, plum and fig tree? An Asian pear? Yes. Pomegranate, probably. But what else? And the dry, cracked dirt that spreads beneath my feet. Certainly, I know how to rejuvenate it. Nothing a little lasagna can't cure. But that task seems overwhelming. Perhaps just in certain spots? One spot yearns for a pumpkin patch - pumpkins clambering and twisting toward the playhouse. But where should the flame seedless grapes go? An arbor over the stairs? Along the back wall? And I'm not tearing out the wild blackberries that bramble aimlessly through out the yard but perhaps they should be joined by friends somewhere in a quiet corner? And finally, should I do raised beds? I rather like having a couple for greens and carrots and such. But where? Hidden behind the fruit trees? Along the side for all to see? After intermingling my flowers and veggies for so long, I know no other way to garden. So you see the dilemma of the blank slate. Where do I start writing on it? I'd love to have a farm feel to this yard and to keep open space for the boys to dig and explore. Please share any ideas, sites, books or what not you might have for this former front yard garden who is delighted to have a backyard garden but hasn't a clue to go about getting one. For one day or afternoon or even hour a week, don't buy anything, don't use any machines, don't switch on anything electric, don't cook, don't answer your phone, and, in general, don't use any resources. In other words, for this regular period, give yourself and the planet a break. Keep your regular eco-sabbath for a month. You'll find that the enforced downtime represents an improvement to your life. You can apply this concept to your own life as simply or as complex as you like - the point is really to increase your mindfulness of your impact on the earth. Here are a few ways to get you started. Declare one day a week a No Buying Day. Make your own fun without spending any money. Declare one day a week a No Driving Day. Have fun at home, or walk or bike to your destination. Have an Eco-Sabbath At-Home Date Night. Have dinner by candlelight, enjoy conversation instead of television, and retire to bed early for some special fun with that special someone. Take it to the full extreme. For one whole day a week, "don't buy anything, don't use any machines, don't switch on anything electric, don't cook, don't answer your phone, and, in general, don't use any resources." Sunday is our No Buying Day. As a stay-at-home-mom, I could easily schedule our days so we're constantly on the go, but to save gas (and my sanity), I specifically set aside a few mornings a week where we don't go anywhere. This year, it's Mondays (my Big Jobs Day), Tuesdays, and Thursdays. Especially during the summer, I try to turn on the oven only once a week. I plan ahead so I can get all my baking done in one day, and I choose meals that don't require the oven. I really like the idea of an Eco-Sabbath Date Night and might try talking my husband into trying that one. Have you tried an eco-sabbath? How does it work for you? The problem: I purchased my camera from a charity auction a couple of years ago and it has served me well, but it did not come with a strap. 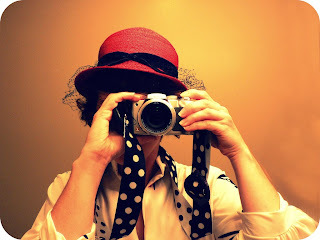 Because of my blog and Flickr addiction I have started to carry my camera everywhere. Which is fine when it fits in my purse, but when at events it's a pain in the arse to constantly pull out and put away. I need a strap and do not want to buy one. The solution: To make one with materials lying around the house. Fold one end of the ribbon over the belt buckle and stitch. 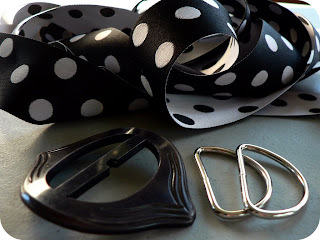 Slide the other end of the ribbon through a D-ring and pass back through the belt buckle. Then loop the loose ribbon-end through the other D-ring. 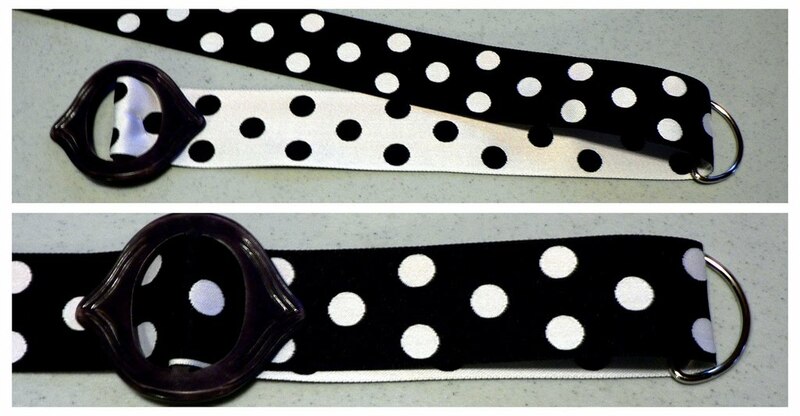 Before stitching this end, adjust the strap to your desired length and pin in place. Cut off the extra length of ribbon, fold end under and stitch closed. Once stitched you are pretty much done. 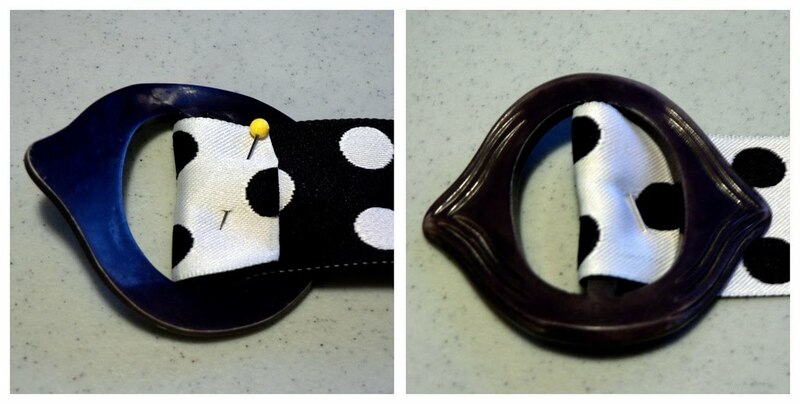 Attach your new strap to your camera and start snapping away! You may be able to attach the D-rings directly to your camera, but the slots were not big enough on mine. This is what I used the two split-rings for. A few weeks ago, EnviRambo wrote that cooking from scratch is making her fat. I'm having a little bit of that problem myself, but I'm also having another problem: cooking from scratch is making me not like eating out. Let me clarify - cooking from scratch is making me only like eating out if we get to go to an expensive restaurant with a really good chef. After several years of cooking from scratch, I've gotten good enough at cooking that every time we go to a restaurant lately, I turn up my nose and declare, "I could have made this better at home." Some foods, though, I'm still working on mastering. I still can't make french fries as good as those from a restaurant (probably because I'm working with real potatoes instead of whatever starchy potato-like substance they use at McDonalds). And until recently, I made pizza that was good enough, but not great. Pizza is perfect for Meatless Mondays because it allows for such diversity. You can use tomato sauce, cream sauce, herbal butter, or pesto. Any kind of cheese you've got hiding in your fridge - from the cheapest cheddar to the most gourmet gouda. Top it with some seasonal veggies, and you've got a perfect meatless dinner that even the kiddos will gobble down. Don't forget to share your Meatless Monday recipes with us using Mr. Linky below! It’s sort of weird; in day to day life, I know two kids is plenty, I have no desire to be pregnant again or have another baby. I really am quite over the whole swollen-ankles-and-heartburn-diapers-and-nursing thing. But then I will read about another nurse-in at a place where a breastfeeding mother was given a hard time, or hear about another study about the for-profit insanity of our current Caesarian rates, or discover a company that makes really lovely pregnancy-and-nursing products I didn’t know about when I could have actually used them…and I feel sort of wistful that I won’t be able to be part of things any more, not the way I was a few years ago. Short version: Good stuff. I mean, it’s not a “magic bullet” when it comes to taking away every bit of itch or pain, but it certainly is soothing. We took it on vacation to Maine over the summer, where you can buy t-shirts depicting a 6-inch mosquito and proclaiming it the “Maine State Bird”. With a parenthetical note saying the mosquito is “shown actual size.” We played in the sun, and weren’t as good about applying sunblock as we should have been. We had campfires and burned our fingers on marshmallows. And this little jar of salve went with me pretty much everywhere. My kids liked it; whenever I used it, on a skeeter bite or tender shoulders, they did say it felt much better. More to the point (since they feel better when any form of goo is put on their ouchies--never dismiss the placebo effect! ), when I used it on my own bites and burns, I did feel fairly immediate relief—not complete, and not permanent, but who expects that, really? It helped significantly. And when I accidentally bonked my hand against a hot oven rack, and smeared the salve on, the relief I felt was at least as notable and lasting as the aloe gel I normally use, and I think probably more. And I still carry it around in my purse, and seem to pull it out for something at least once every few days. From an herbal perspective, all the company’s products are very impressive, as are their professional ethics—they seem to have just the right assortment of herbs infused in oil and thickened with organic beeswax. In this case, calendula, comfrey, plantain, and marshmallow root—very basic and simple herbs, but all very soothing and healing. There is very little odor in the salve—I personally, when I make salves, favor addition of some essential oils which also give fairly marked odor—just because I like it. But lots of people don't care for the scents. This salve and most of this company’s products are probably as “unprocessed” as one could possibly make. Which I also like a lot. Realistically, would I go out and buy another jar when this one runs out? Honestly…probably not. But I’m someone who has been making my own specialty salves for about 6 years—because I have a fairly good collection of essential oils and know which ones to add for which salves, what soothes, what kills germs, what kills fungus (tea tree oil and grapefruit seed extract! ), what heals hemorrhoids, and so forth. 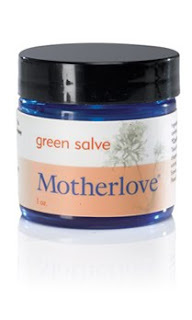 But if you’re not into that sort of thing, and you’re pregnant or a nursing mom, Motherlove has some really good stuff (including Rhoid Balm). And their prices are very comparable to what you'd get from many places for products that are this natural and labor-intensive to create. They have some nice gift packages too—good shower gifts! Highly recommended.